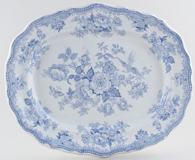 Blue China - 17812 items found. Blue printed backstamp Aladdin over crown with Adams, Estd 1657, England. Five bar toast rack. It has a little brown mottling to the bars and underneath the base otherwise fine. Blue printed backstamp Aladdin Adams Estd 1657 England. Backstamp: Alladin Adams Estd 1657, England. There is a little discolouration to the base rims and underneath three of the corners have tiny chips. The cover has some discolouration underneath and small minor firing fault by the handle join otherwise excellent condition. This lovely stand features Mount Vernon, Virginia, surrounded by a pretty floral border. Backstamp: Old English Staffordshire Ware Made in Staffordshire England by the Adams Potteries Estd 1657 Imported Exclusively for Mount Vernon Shops Mount Vernon, Virginia. Also bears Jonroth mark (the importers) Excellent condition. 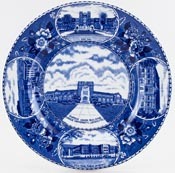 Lovely plate with Purdue Union Building taking centre stage and images of Cary Hall, Purdue University Library, Field House Purdue University and Hall of Music and Administration Building around the rim. Backstamp: Purdue Old English Staffordshire Ware Johnroth England Adams est 1657 England Made in Staffordshire England imported Exclusively for H G Reisner Book Store DEAC'S West Lafayette IND. Surface scratching and on the back some wear and a little discolouration. Lovely plate printed ina rich dark blue, featuring Mount Vernon. 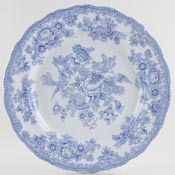 Backstamp: Old English Staffordshire Ware Jonroth England Made in Staffordshire England by the Adams Potteries Est 1657 imported exclusively for Mount Vernon Shops Mount Vernon, Virginia. Some surface scratching and on the back discolouration, overall absolutely fine. Central view of the Cadet Chapel and featured in the vignettes around the rim are Duty Honor Country, Battle Monument, Trophy Point & the Hudson, Catholic Chapel and Washington Hall. Excellent condition. 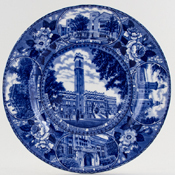 Lovely plate printed in a rich dark blue, featuring Vanderbilt University Nashville. Around the rim are vignettes of Alumni Hall, The Gymnasium, Medical School Entrance and Kissam Hall. Backstamp: Historic Vanderbilt University Nashville Tennessee. Old English Staffordshire Ware Jonroth England Made in Staffordshire England Imported Exclusively from The Living Endowment of Vanderbilt University Nashville Tennessee Adams Est 1657 England. On the back there is a little blue smudging otherwise excellent condition. Back stamp for W and T Adams. Some crazing and staining. Originally would have had a cover. Lovely dish standing on four small feet. Good transfer on the outside. Possible marriage as the base is slightly more of a steely blue than the cover, but they fit and go together very well. Minor stress signs by the base of the loop handle to the cover but these have been glazed over. Overall excellent condition. Base marked W&TA Tunstall. A most unusual rectangular tureen, by William Adams and Co., standing on six small feet. Printed in a lovely soft blue. A little wear to the inside rim of the tureen, not noticeable when cover in situ. One of the side handles has a hairline, and the cover has a crack. A fine display piece. 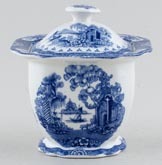 Lovely tureen and cover. Although both have light crazing with some associated discolouration inside the tureen only, both pieces are still bright. A few signs of age but in lovely condition. Blue printed backstamp. Clean and bright with wavy rim. Blue printed backstamp. A lovely plate. In excellent condition, except for a chip on the back. Blue printed backstamp Wm Adams & Co Tunstall. Large hexagonal pot in excellent condition. Cover has cut out for spoon. Backstamp: Baltic Adams Member of the Wedgwood Group 1657 England English Ironstone Est Micratex. R & W Scott Ltd Carluke Scotland. (the latter were the retailers). Excellent condition. Hexagonal pots with ribbed base. Backstamp: England. Tiny tiny nick to the hole in the salt, otherwise excellent condition. Small under rim chip to cover otherwise fine. Round dish with cover. Backstamp: Baltic Adams Est 1651 England Hand Painted in Real English Ironstone Decoration completely underglaze acid and detergent proof. There is a little wear to the rim of the cover and touch of blue smudging otherwise excellent condition. Elongated hexagonal dish with cover. Excellent condition. Elongated hexagonal dish with cover. A little wear to the underside of the lid otherwise excellent condition. Pretty little dishes, a little like a saucer but without the indent for the cup to sit in. Would make great little nut/nibbles or butter dishes. Excellent condition. Light all over crazing otherwise fine. This is a wonderful little set of stand, tureen, cover and best of all - a ladle! There is a little very minor wear around the rim of the tureen, otherwise all in excellent condition. Octagonal stand. Backtamp: Baltic Adams Real English Ironstone Est 1657 England Micratex Decoration completely underglaze acid and detergent proof. A little minor surface scratching otherwise excellent condition. Hexagonal. A little minor wear to the handle otherwise excellent. A little minor wear to the handle otherwise excellent. This is the sauce boat with fixed stand. The stand has a few little inky marks otherwise all in excellent condition. Hexagonal boat and stand. Just a touch of crazing to the stand. Small cup after dinner coffee cup. Backstamp: Adams Est 1657 England. Wear and discolouration to rim, handle and footrim. Cups have crazing with a little associated light staining inside. Teacup only, no saucer. Excellent condition. Round shape cup. Wear to foot of cup. Backstamps vary: Adams Member of the Wedgwood Group Real English Ironstone Micratex Est 1657 England and/or Adams Made in England Real English Ironstone Established 1657. A little minor wear and touch of crazing to the saucer otherwise excellent condition. A most unusual tall cup with saucer. Backstamp: Baltic Adams Est 1657 England. A couple of minor blemishes to the saucer and also the the cup, overall excellent condition. Lovely little cup and saucer in excellent condition.